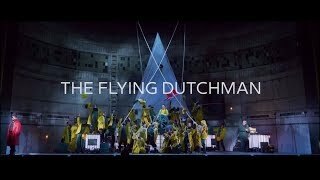 Der Steuermann Dalands Frederick Ballentine, Jr.
A haunting new production of “The Flying Dutchman” has dropped anchor in Music Hall, and it is spectacular. Cincinnati Opera presented Wagner’s mythical opera on Thursday in a striking new co-production with Atlanta Opera and Houston Grand Opera. It was Cincinnati’s first performance in 20 years. The updated, multimedia tale of the Dutchman, who is doomed to roam the seas in seven-year cycles until a woman’s love can release him from his curse, gripped viewers from beginning to end. A top-notch cast of singers populated the Norwegian fishing town where the Dutchman comes ashore. Video projections by S. Katy Tucker conjured the mystery and otherworldly atmosphere that surrounds this ghost story, giving it thrilling sweep. But equally impressive was the magisterial playing by the Cincinnati Symphony Orchestra in the pit, led by Christof Perick. Throughout the opera, the horns – totaling nine players – brought thrilling power to the recurring heroic themes of the kind that Wagner would later refine as leitmotifs in his “Ring Cycle.” The music seamlessly evoked the churning sea and the storm-tossed ship and added emotional heft to the tormented psyche of the Dutchman.